Speaking of chronology stumpers, there is the matter of Finger’s “outing” as co-creator of Batman. 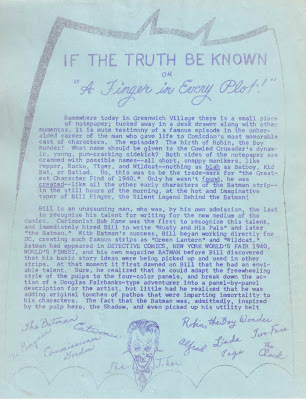 This happened with the article “If the Truth Be Known or ‘A Finger in Every Plot!’” which Jerry Bails wrote and published in the 9/65 issue of his fanzine. This is scanned from an original, courtesy of Aaron Caplan. The interview that led to the creation of Bails's myth-changing article took place sometime in the summer of 1965, when Bails interviewed Finger at Finger’s apartment. That same summer, Bails also moderated the creators’ panel at the New York Comicon (during which Finger made the statement that is the focus of the previous post). But which came first, the interview or the panel? Therefore, at this point, especially when taking into account Bails's integrity, it would seem that the panel did come first, then the interview. However, upon rereading this statement, it's not clear if Bails is speaking chronologically. People generally do, but Bails's wording does leave room for debate: He says "and," not "when." In other words, he's not explicitly stating that he (along with other comics people who were with him at the interview, hence the "we") got Finger to appear at the panel while at Finger's apartment for the interview. Again, at the panel, Finger was not referred to as a creator or co-creator. And “If the Truth Be Known” did not come out until after the panel. 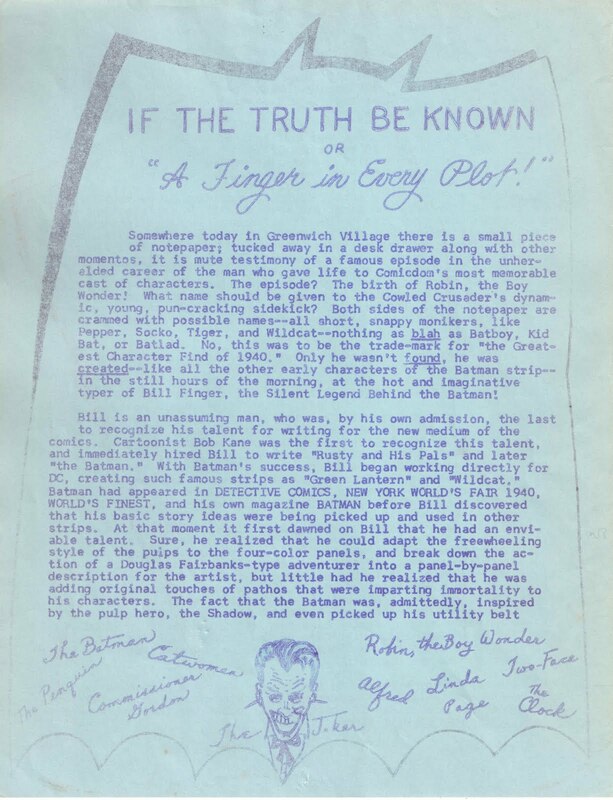 So to fans at that comic convention, Finger was an early Batman writer, but not necessarily the first writer, and certainly not the co-creator. On multiple occasions, Bails’s recall awed me. However, forty years packs a lot into the gray matter and even the sharpest memories can produce a contradiction. When that happens, a writer has to make a judgment call. So in this case, I believe that the accurate scenario is my initial interpretation of Bails’s 8/13/06 statement—I believe Bails interviewed Finger before the panel and, at that interview, invited Finger to be on the panel. I believe this mostly because, during the panel, Bails remembers a comment Finger made “the other evening.” Also during the panel, Bails specified that he had been to Finger’s apartment. Though not certain, I do believe Bails once said his first meeting with Finger was for the interview. And considering Bails's detective nature, it seems consistent to me that he would first conduct a private interview and only then decide (or get the idea) to ask Finger to be on a panel. Because it relates to the issue that continues to impede Bill Finger’s legacy: lack of credit. If the interview had come first, why didn't Bails refer to Finger as “co-creator” at the panel? It wasn’t because he was afraid of Bob Kane’s response, since mere months later, Bails did publicly give Finger credit for Batman. Perhaps Bails simply wanted the potentially wider impact of revealing the Finger bombshell in writing. I can’t try for further clarification from Bails. He passed away in November 2006, three months after my last e-mail exchange with him. I was honored that I had the chance to correspond with Jerry Bails; he was known as the father of fandom, which in practice meant he championed the creators as much as the fans. Regardless of whether it was panel-interview or interview-panel, if not for Bails, we may never have known the truth about Finger. God bless Jerry Bails for giving Bill Finger writer and co-creator credit for Batman in the fanzine and publicly while Bill was alive. It's too bad DC and Bob Kane didn't follow his lead and finally credit Bill also in 1965.